Back with a card for One Layer Wednesday. This week Susan challenged us to do some ink layering on our cards. Ink layering is something I tend to do when I'm making one layer cards. I like stamping an image in one color of ink and then layering a sentiment over the image using a darker ink. But usually I just keep it to two inks. For this card I used more than just two inks. For the card I got out two of my older PTI sets, Text Box and Spiral Bouquet. The Text Box set contains a set of rectangles that have different images on them. For my card I actually turned one of them over and inked up the flat, blank side and stamped it on the cardstock using Memento New Sprout ink. I then layered the stem from Spiral Bouquet over the rectangle using SU! 's Pear Pizzazz ink. The flower heads were stamped using SU! 's Pretty in Pink and Melon Mambo. Finally, I stamped the word "Bloom" from Spiral Bouquet using Pear Pizzazz and then layered "where you are planted" over that using Melon Mambo. I really like how the card turned out. Hi! 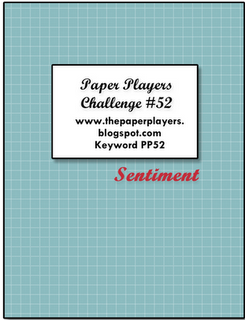 Here with a card for the Paper Player's challenge this week. 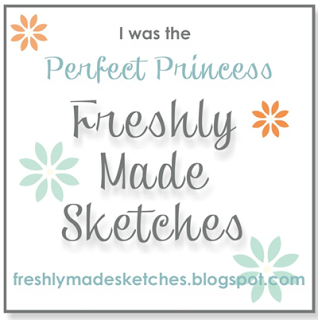 A sketch challenge brought to us by the super talented Lesley! Once again I created a card based on what supplies I had sitting on my kitchen counter (which doubles as my crafting place). One of the things sitting on the counter was my DCWV Lemon Flower mat stack. Of all the mat stacks I have purchased I think I love this one the best! The colors are just so bright and yummy! And I just love the addition of the silver/grey... it looks so fabby with the yellow and green. The only stamping on the card is the sentiment from My Favorite Things. The butterfly was created using my SU! Beautiful Butterlies die. Just Add Ink to CR84FN! A short post with a card for two challenges: CR84FN and Just Add Ink. I have wanted to participate in a Just Add Ink challenge for months now after I discovered it on my ramblings around the bloggo-sphere, but have never been able to find the time. I was bound and determined that I would get one of their challenges in before the time for entering was up! The JAI challenge is a sketch challenge and I thought the layout would make it easier for me to complete my CR84FN card. On Sunday night I actually started the card, but well... it just wasn't working for me at the time so I gave up. I thought I would get back to the card yesterday, but I actually ended up using part of the original card for another card that thankfully came together rather quickly. So, after a bit more thought and a slight change in the materials used I was finally able to get my card done and with only a few hours to spare before time is up on the current JAI challenge! Whew... nothing like a deadline to get your mojo kick started! Anywho... the patterned paper is from the DCWV mat stack called Lemon Flower... love that paper. The stamps are from My Favorite Things. A short post with my card for One Layer Wednesday. 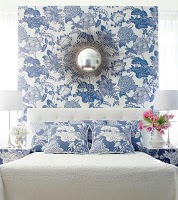 Susan provided us with a beautiful photo she purloined (stole as she put it) from Pinterest to use as inspiration. There are many different directions you could go in with the photo, but I chose to focus on the colors. The main colors in the photo are yellow, green, and white. But one thing I noticed was the centers of some of the flowers were a dark sort of burgundy color which provided a nice contrast. So when I put together my card I used a burgundy colored ink for the sentiment to provide that same bit of contrast. Hello! Back with another post today... this time for Less is More. Apparently last week's challenge to use monograms on our cards caused a some grumbling amongst the faithful LIMettes, ala the much reviled "acetate" challenge. Ah... but that is what a challenge is all about, right?? To challenge us and get us out of our creative boxes. Anyway, this week Chrissie and Mandi provided us with a simple, but lovely sketch as an antidote to last week's challenge. Now, I just spoke a bit about being challenged and getting outside our creative boxes and what did I do??? Stayed right inside my creative box!! Unfortunately, I wasn't feeling too terribly creative today so I played it safe. I have only recently jumped on the felt bandwagon and so used the two colors I had purchased from PTI for my card. I cut the felt using a set of PTI flower dies and sewed them together using embroidery floss. The buttons are also from PTI. The sentiment is from My Favorite Things. I think I will be giving this to my niece for her birthday. Hey everyone!! 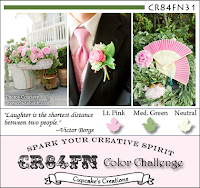 Here with my last post as a guest designer for ODBD's Shining the Light challenge (boo hooo!). This week the challenge is anything goes just use your ODBD stamps and because ODBD will be revealing new stamps on the 1st of July this challenge will last two weeks so you have plenty of time to get your card done. For my card I decided to use the ODBD Brocade background stamp and a sentiment/verse stamp from the ODBD set, Porch. My color scheme is pretty girly so I added a lovely crystal and pearl flourish from Prima (which I actually cut up so I could place the different swirls where I wanted them... love being able to do that!) and some super sweet pink Prima Fairytale roses. While ODBD stamps are not required in order to play along with the challenge, we sure love seeing them on your cards. So use them if you have them! All players using ODBD stamps will have the opportunity to be chosen for the Shining the Light award. Finally, to make the challenge even more fun one randomly drawn player will receive a $15.00 gift certificate to use toward anything in the ODBD store! Please make sure to check the projects from the design team of Chris, Pat, Fran and Sabrina. I downloaded the template from Nichole Heady's blog (you can get it here) and printed it out on white cardstock. I trimmed it out, punched the hole for the teeny tiny bird to get in and put it together using Scor-Tape (love that stuff... has a super strong bond.). I then diecut the roof and the base from dark red and navy cardstock using a Spellbinders small long scalloped rectangle die (3rd smallest die) and a Spellbinders small scalloped square die (3rd smallest) and adhered them to the house. The scalloped "bunting" was created by stamping one of the doily images from the WMS set Dainty Doily on white cardstock using dark red and navy ink and then trimmed as shown. Some small stars from Hero Arts set were stamped using the same inks and adhered to the house to finish it off. Not very elaborate, but I think very cute. After I finished taking the photos I had to give the birdhouse to my five year old because he was COMPLETELY fascinated with it! Make sure you check out all the fabulous projects from the JUGs design team of Kristin, Pam, Dana, Lisa, Maria, Kathryn, Andrea & Elise. A short post with my card for this week's Flourishes Timeless Tuesday challenge. The fabulously Betty is the host this week and she has challenged us to use paper bags!! Yes, you read that right paper bags. Sounds kinda funny, but it was actually easy to incorporate some into my project. Earlier this month during the Flourishes' new stamp release festivities design team member Cindy Lawrence made the most amazing card using Spellbinders Labels 21 dies. After I picked my jaw up off the floor I decided that I would give it a try and make a card using my Labels 21 dies. My card isn't nearly as gorgeous as her card, but I really like how it turned out. I used the Flourishes set Wreaths of All Seasons and made a sort of patriotic card. And where is the paper bag you might be asking? 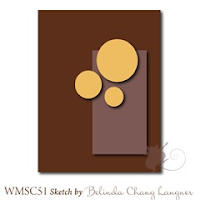 The scalloped diecut circle you see framing the diecut image is from a brown paper bag! My card is a CASE of a card in the Splitcoaststampers gallery of Tami Mayberry. 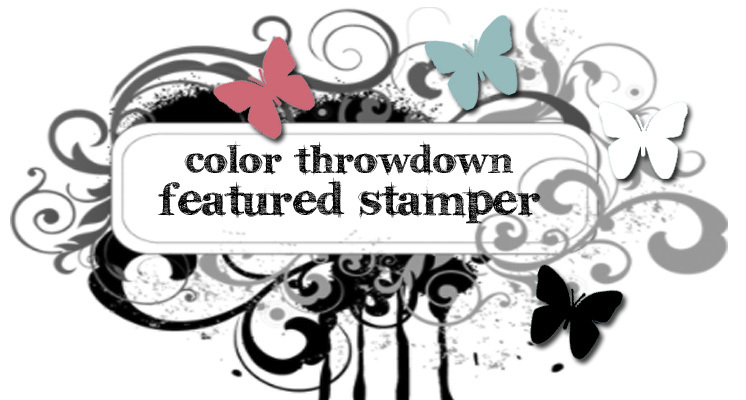 Tami is this week's featured stamper over at SCS. Several weeks ago I had the honor of being the featured stamper and having some amazing stampers CASE cards from my SCS gallery. I had so much fun viewing all the card that were made I decided I was going to start participating in this weekly challenge. Thus... my card. Everything about this card just makes me happy... the white space, the simplicity of the design, the colors and the placement of the rhinestones. To me this card is completely what I am all about when it comes to cardmaking... keeping it clean and simple. Hey everyone! 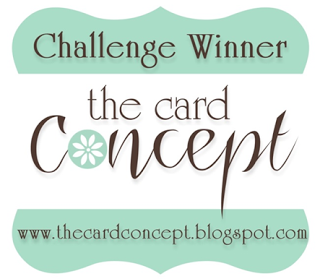 Here with a card for two challenges: DeNami Design and the Paper Players. 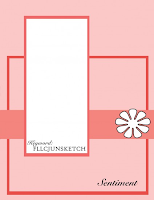 This week the challenge over at the Paper Players is a CAS challenge requiring you to use a sketch provided by the amazingly talented Jaydee. The great thing about her sketch is that despite being some what simple in design, there really are many directions you could take it. For my card I decided to keep simple because I was combining it with the DeNami Design color challenge. The colors are purple, light blue, kraft and chocolate. A lovely combo provided by the very talented Andrea, but for some reason I was having a hard time coming up with something that worked.... until I saw the sketch. Thank goodness for that sketch! I used the DeNami stamp, Rosebud Trio, and a sentiment also from DeNami. The image and sentiment was stamped on white cardstock using chocolate ink and purple buttons (from PTI) were adhered over the flowers and the edges inked with some purple ink. The image was matted with some kraft cardstock. I decided to add some texture to the light blue panel by putting in my Swiss Dot embossing folder and running it through my Big Shot. The only change I made to the sketch was putting the sentiment immediately under the image. So... there it is a very simple little card. 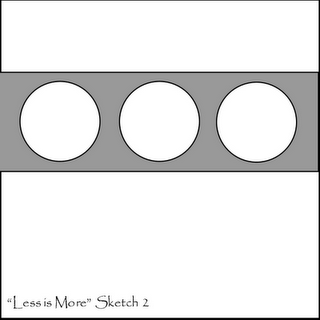 Hey everyone... back with my card for this week's Less is More challenge. Chrissie and Mandi (the head LIMs) sure know how to pick some great challenges and this week's challenge is no exception! What is the challenge you might ask?? Well... the challenge is to use monograms on your card. When I saw the challenge I thought "oh no... how am I going to do this one??" Then I remembered that I had an alphabet set from JustRite Stamps that would work perfect for the challenge. The set is really neat because it contains 3 sizes of the font (Brayton). I decided to make a traditional type of monogrammed card using my initials RJD. With a traditional monogram of this type the middle initial is the one from your last name and then the other two flank that one. Usually the flanking initials are in a smaller font size, as well. The card was made using supplies that I had out on my kitchen counter: white, black and green cardstock and green and black inks. I also used the Waltzingmouse Vintage Labels 2 set and some Spellbinders dies. Hey everyone... time for another challenge with Our Daily Bread Designs. 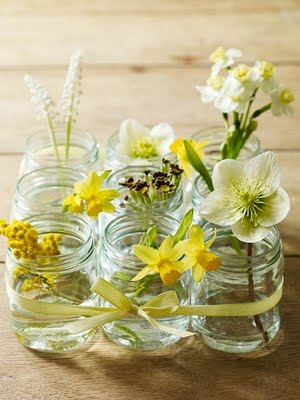 This week the challenge (ODBDSLC65) is to make a thank you card or gift. For my card I decided to use the ODBD set Flourished Christian Symbols and the ODBD Single Butterfly stamp and coordinating die. While this isn't a traditional type of thank you card, the verse I chose is most definitely one of thankfulness. Once again I went clean and simple with a bit of shabbiness thrown in for good measure. To play along with the ODBD challenge you do not need to use ODBD stamps, but if you have some we would love to see them. However, if you would like to be considered for the Shining the Light award your project should use ODBD stamps. To add to the fun one randomly chosen player will win a $15.00 gift certificate to the ODBD store! Thanks for taking a peek... please don't forget to check out the projects from the amazingly talented ODBD challenge team of Chris, Pat, Fran, Sabrina & Silke! Hey everyone!! Time for another super fun JUGs challenge. 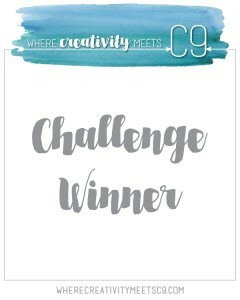 This week the challenge is a color challenge being brought to you by my totally talented and incredibly funny bloggy friend, Elise (Mamacow Creations.... if you haven't checked out Elise's blog you really really REALLY must do so... she is a HOOT!!!)!! Just take a look at the yummy colors she has picked to inspired our creativity! She pulled these fun, fun colors from the October Afternoon Five & Dime line. For my card I decided to pull out this really neat stamp I bought from Stampin Up! called Patterned Pieces and pair it up with an image and sentiment from the Hero Arts set Sew Stylish for a little sewing fun. I stamped the Patterned Pieces stamp on some October Afternoon Thirft store paper using Riding Hood Red ink. I chose to not trim out the pieces, but leave the image as is. The ruler was stamped on yellow cardstock with the Riding Hood Red ink and trimmed out. I assembed the card and finish things off with the sentiment and a bright green cord button. Thanks for taking a peek... I hope you will check out the projects from the JUGs design team of Elise, Dana, Lisa, Kristen, Pam, Maria, Kathryn and Andrea. And yes... I realize my aqua will probably be considered by some to be more of a bright blue, but to be honest aqua can encompass a range of colors. After stamping the trees I just had to adds a couple of bright blue cord buttons because they just looked so darn cute!! Anywho... 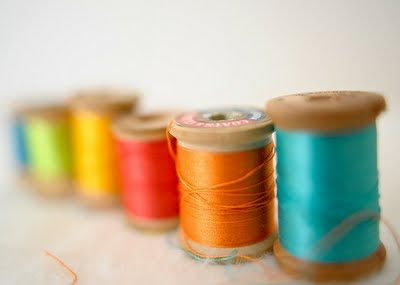 I'm also going to be putting this in to the current Moxie Fab Tuesday Trigger because well... the bright colors in the photo just make me think of summer! 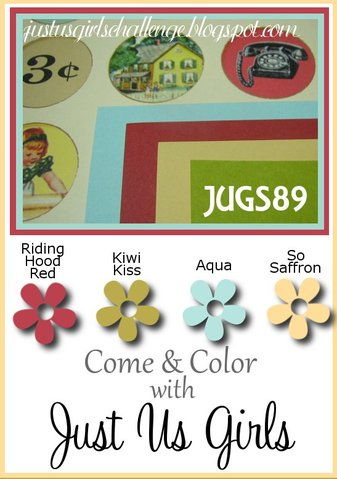 Supplies: Cardstock: PTI white; Stamps: Hero Arts; Inks: Memento - Bahama Blue, Tangelo & Dandelion; Buttons: DeNami Design & SU! Okay... I know I have used the Waltzingmouse Dainty Doily (large) set alot lately, but I just love that set and it is so versatile! Today I paired it with the color combo from the current Paper Players challenge of Pear Pizzazz, Melon Mambo and Delightful Daffodil and the current WMS sketch. Another favorite WMS set is the Frame It set. When I saw the WMS sketch on Saturday morning I immediately thought the rectangular frame from the Frame It set would be perfect for the sketch. Hi! Back with my third post today! Don't generally like to do multiple posts in one day, but I just can't help myself when it comes to the Less is More challenge. I just have to get my card done and posted the day the new challenge comes out... weird, I know! This week the challenge is to make a one layer card and to put our image and/or sentiment in a frame. So immediately I thought of my Waltzingmouse Frame It set. For today's card I combined that set with the SU! set Good Neighbors and created a little scene. I managed to get the rectangular frame stamped in the center of my card after only one try. Love it when that happens!! Hey everyone... time for a new challenge from ODBD. This week the challenge for ODBDSLC64 is to make a ribbon bookmark. 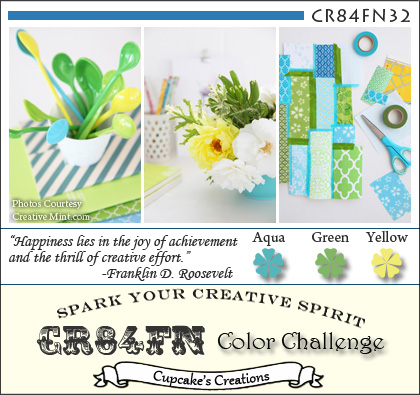 As I was deciding what ribbon I would use I thought I would combine the challenge with the current color challenge over at CR84FN. The colors this week are pink, green and a neutral. For my neutral I decided to use cream. For my bookmark I decided to use some really pretty pleated pink ribbon from May Arts. I cut a piece of the ribbon about 20" long and then layered on top of it a piece of cream crocheted ribbon. Both ends were then cut to form the "fishtail" ends. I die cut two scalloped circles using the 4th largest Spellbinders Small Scalloped circle die. 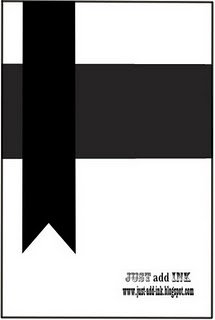 These pieces were adhered to one end of the ribbon as shown. I stamped the image from the ODBD set "Serve the Lord" on cream cardstock with Memento Bamboo Leaves ink and then colored with Copic markers (RV00, YG03 & YG23). The image was then die cut using the 4th largest Spellbinders small plain circle die and adhered as shown. I diecut two smalled scalloped circles and adhered them to the other end of the ribbon as shown. The verse from the Scripture Col. 7 on cream cardstock using SU! 's Pear Pizzazz and then diecut that with the corresponding plain circle die. I adhered that as shown, added the little rose and I was done. Thanks for taking a peek... I hope you will play along with the challenge. You don't need ODBD stamps to participate, but if you wish to be considered for the "Shining the Light" award you do need to use ODBD stamps. To make the challenge even more fun one randomly drawn participant will win a $15.00 gift certificate. And don't forget to check out what the rest of the challenge team of Chris, Sabrina, Fran, Pat & Silke have created! Hey everyone.... hope you all had a good week. This week over at the JUGs blog the challenge is a super fun technique called woodgraining. I hope you don't mind, but I'm not going to give you an explanation as to how you do this technique. Instead I going to provide you with the link so you can watch the lovely and very talented Gina K. of Gina K. Designs explain how you do this technique (she does a far better job then I would anyway!). One thing I will say that I learned from doing this technique is that your pigment ink pad should be a fairly "juicy" one. I used two different pads one that was pretty "juicy" and one that was not. The piece I ended up with when I used the not so juicy pad was a complete failure. Anyway, on to my card. This technique is perfect for masculine cards and so it was just natural that I make a Father's Day card. I used the Flourishes set "What a Catch" and some Stampin Up! designer paper that I bought a few years ago that has a very masculine feel to it. The panel piece behind the stamped image is the piece that I created using the woodgrain technique. The effect is really cool in real life. I think I will be giving this card to my father in law. I am also going to be putting this card into the current Flourishes Timeless Tuesday challenge to make a Father's Day card. Thanks for taking a peek... I hope you will check out what the so very talent JUGS team of Kristen, Pam, Lisa, Andrea, Maria, Dana, Kathryn & Elise have cooked up! Hey everyone! Boy... even it has only been a few days since I last posted a card, it feels like so much longer! Got a card today for three challenges. 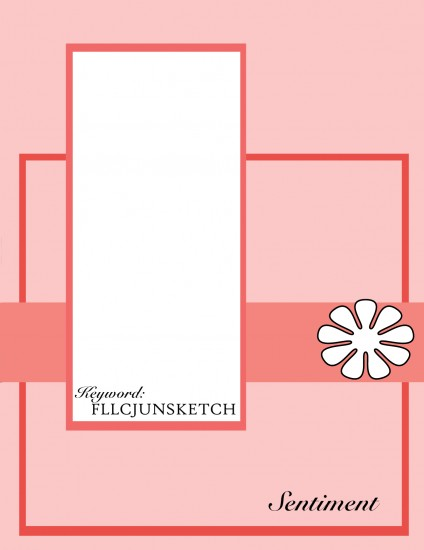 Right now Flourishes is in the middle for their June release and there are lots of fun things happening like their current sketch challenge. 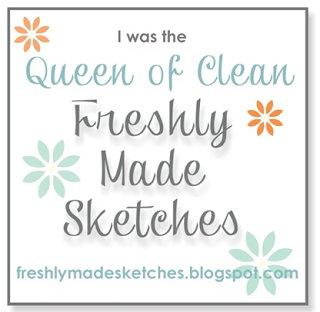 Participating in their sketch challenge is just one way to win their entire June release! So I combined their sketch challenge with the current color challenge from ColourQ and the current Shabby Tea Room challenge to use embossing. I went digging through my stash of papers and found some Jenni Bowlin/Core'dinations embossed cardstock and some Jillybean Soup patterned paper that fit the ColourQ challenge perfectly. (I don't know about you, but I'm terrible about going through what I have to see if it will work for any one of the challenges I like to participate in. 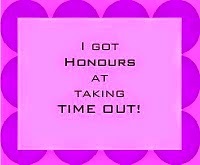 Gotta start changing that!!) The Core'dinations cardstock was already embossed so I simply sanded it to bring out the embossing a bit more. The image is from the SU! set Fast & Fabulous. I stamped the line image using SU! Early Espresso and then the coordinating solid image using Cherry Cobbler. The image and the mat were cut using my Spellbinders Long Plain and Scalloped Rectangle dies. The sentiment in from the Flourishes set Lentin Rose. Just a quick post with the names of the winners from my giveaway. I put all the names in a hat (well bowl actually and these are the two I picked out: Greta H. and Elise!! Congrats, ladies!! Email me with your addresses and I will get your prizes out to you!! A card for two challenges today: Paper Players and Stampin Sisters In Christ. 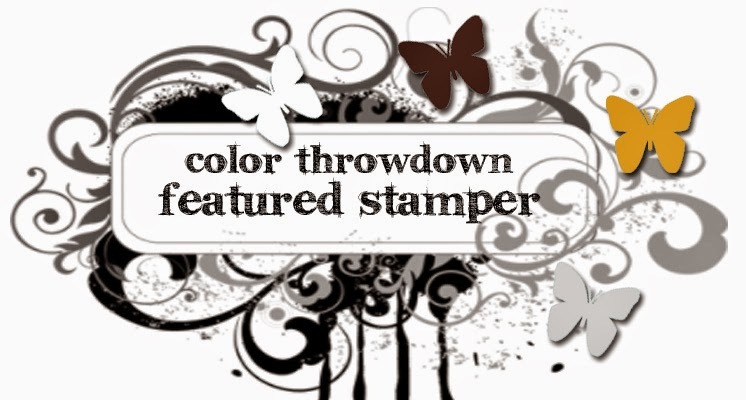 The Stampin' Sister in Christ challenge is to use something new on your project whether it is new products, technique, etc. 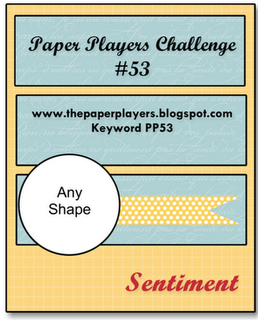 The Paper Players challenge is to make a thank you card. So... for my card I used some brand new Memory Box products that I bought on Saturday. Memory Box has some beautiful paper packs and recently came out with a new pack called "Valise". When I saw that Memory Box had printed the patterns on kraft paper I knew I had to get a pack. So on Saturday morning I made a trip to Impress Rubber Stamps and picked up the Valise papers and a set of new Memory Box dies called "Bakery Labels". I used both for my card. Now over at SSIC, Linda (Lovely Linda) provided the most wonderful devotional based on John 13:34-35 and the new commandment. I loved her explanation that by keeping the new commandment that we love one another the way Jesus loved us that we are not putting away the ten commandments, but gaining a new tool to help us keep the ten commandments! Thus, the challenge to use new products, techniques, etc on your card. Making my card a "thank you" card just seemed a good fit. One of the neat things I discovered about the Valise collection are the sheets of various tags that come in the pack. I cut one out and stamped the Memory Box Butterfly Collage stamp on it using SU! Baja Breeze. A second butterfly was stamped, trimmed out and then covered with Diamond Stickles. Once it was dry it was attached to the first butterfly. I used the bakery labels die to cut out a label and then stamped "thank you" on it using Baja Breeze. I feel like the card is missing something, but overall I'm happy with it. One more post for the day... I told myself I wasn't going to, but the Less is More challenge was singing its siren song to me and I just had to make something and get it posted. This week's challenge is to go monochromatic. Sounds easy enough... but I ended up having a bit of a challenge with it. I combined the LIM challenge with the new sketch from Waltzingmouse. And once, again, I used the Dainty Doily (Large) set from WMS. Can't seem to get enough of it right now! For my card I used Stampin Up! 's Cherry Cobbler cardstock and ink, along with PTI's white cardstock (my favorite). The small doily images were stamped and then diecut using the 2nd smallest die in the Spellbinders Big Scallop Circle dies. The sentiment is from the WMS set Frame It, another favorite... oh shoot! 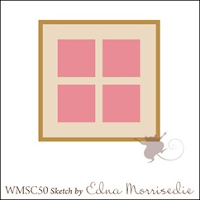 Might as well come clean... all my WMS sets are favorites!!! I think I'm also going to drop this into the current Wee Memories challenge which is "anything goes"
Wow... second post of the day!! Click here for my JUGs card. 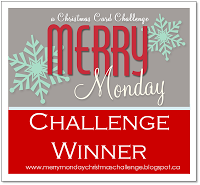 This week at the Shining the Light Challenge over at ODBD is to use only a sentiment on your card. I went very masculine for my card since I am going to be giving this to a wonderful person named James who spends his Sunday mornings singing worship music with the little ones in my church's Sunday school classes. I met James last summer when he started his music ministry in the Sunday school class I taught at my chuch. I cannot tell you what a blessing he has been to me and to the children that he sings with every Sunday. Sadly, I won't be spending my Sundays with him any longer as after 10 years of teaching I made the decision to step out of that ministry and spend some time seeking after what God has planned for me next. Because James sings and plays his guitar I chose to use the ODBD set "Sing to the Lord". I used some patterned paper from Stampin Up! and drew my color choices from the papers. To give it a rustic feel I did some distressing and used twine as an embellishment. To play along with the challenge you don't need ODBD stamps, but if you wish to be considered for the Shining the Light award your card must use ODBD stamps. Make things even more fun one random winner will be chosen and that person will receive a $15.00 gift certificate to the ODBD store! Thanks for taking a peek... make sure to check out the projects from the ODBD challenge team of Chris, Sabrina, Francie, Silke, and Pat! Eeeekkk!! I cannot tell you how excited I am to be the JUGs Featured Designer for the month of June!! When the lovely and talented Pam emailed me with the offer I didn't hesitate for one minute! You see... JUGs was one of the very first challenge I ever entered and from the get go the JUGs gals were just so sweet and made entering their challenges so much fun! I can't say enough good things about these wonderful ladies. But I must move on to my card! This week the challenge over at JUGs is a sketch challenge and the amazingly talented Kathryn, who is the challenge hostess this week, has provided us with this fantastic sketch. For my card I used the Waltzingmouse set Large Doily, along with a sentiment from the PTI set Think Big Favorites #1. 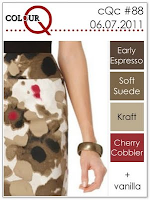 My color inspiration came from this week's Tuesday Trigger over at Moxie Fab World. I just loved the pale blues combined with the white and then that beautiful pop of pinky-purple. I stamped the largest doily image on white cardstock using SU! 's Marine Mist. Then a smaller image was stamped in the center using SU! 's Soft Sky. A 3rd large doily was stamped on a piece of white cardstock using Marina Mist and die cut using the largest die from the Spellbinders Large Scalloped Circle dies. The piece was adhered over the top of the stamped images and then trimmed as shown. A smaller image was stamped using Soft Sky, die cut and adhered to the center. 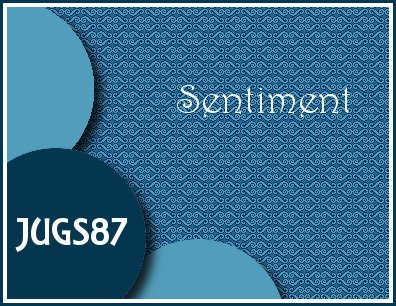 The sentiment was stamped using Hero Arts Hero Hues Iris ink. Thanks for taking a peek..... and don't forget to check out all the loveliness from JUGs team of Pam, Kristen, Elise, Maria, Kathryn, Lisa, Dana and Andrea. I haven't done a One Layer Wednesday challenge in what seems like a very long time! Susan's last challenge was to find inspiration from some lovely baby shower cakes over at the Cake Wrecks blog. Now I found several cakes that inspired me, but none of my ideas worked for a one layer card. (insert frowny face). Then last week Jennifer asked us to use a dog or a cat image on our card. Well I was definitely out for that one as I don't own a single dog or cat stamp (insert second frowny face). Thankfully, this week I can play along as Susan has asked us to make a father's day card for a special father we know. My dad has been gone for far more years then I care to count and I miss him tremendously, so this card will be going to my brother who is currently being treated for non-Hodgkin's Lymphoma. He is a really great guy and I love him to bits! The stamps are from the newly released Flourishes set "What a Catch"! Hello everyone! Today I'm sharing a card that was published in the July/August issue of CardMaker magazine. And to celebrate that fact, as well as the fact that I have been blogging for a year and recently posted my 300th post I'm doing a little giveaway! 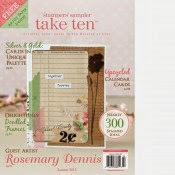 CardMaker generously provided me with two free copies of the July/August issue and I will be giving those away, along with a few extra surprise goodies. Simply leave me a comment by 8:00 pm PST on Sunday, June 5th. I will pick a winner on Monday. The card was made using the Hero Arts set, Galaxy of Stars, as well as a sentiment from a PTI Fillable Frames set.